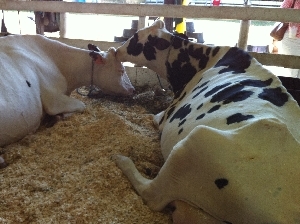 Accidental Locavore: Dutchess County Fair, Cows Are Huge! This week, theAccidental Locavore had no basket because farmer Paul and his family were camped out at the Dutchess County Fair. Their cows came in third and sixth, and their son Will got ribbons for his jalapenos and the other veggies he raised. Will was the one who taught me last summer what to look for in a jalapeno. You want the ones that have little lines on them, not the smooth unmarked ones. It doesn’t matter whether they’re red or green, they start out green and go to red. It never ceases to amaze me how big the cows at the fair are. Some of them are so large, it’s pretty amazing. Along with the cows, we cruised the pig barn, and the exotic chickens. My favorite part was the diving dogs. I don’t know if you’ve ever seen it, but they have a competition where the owner throws a toy into the end of a pool, the dog takes a running leap into the pool, and the dog who jumps the farthest wins. Some of these dogs jump 20 feet or more before they land in the pool. But most people go to the fair for the food…we were told that not to be missed were the milkshakes from the 4H club, and since this is a locavore blog, I’m happy to say they use Hudson Valley milk. Since I was a little kid, there was only one flavor for me, chocolate, so that’s what I had, and it was good. Not sure if it was really good, or if it was just the first milkshake I’ve had in years, but it was delicious. My friends also made a beeline for the Greek stand and had great gyros. That was about it, amazingly enough, no fried food, tempting as the deep fried pickles might be (not!). When we weren’t at the fair, what was I cooking? Coleslaw and potato salad. I had a big purple cabbage from the last farmbasket, so I made party-colored coleslaw. Traditional potato salad is one of the few potato preparations I don’t like, so I always make a version of a French potato salad. Recipes on Friday.